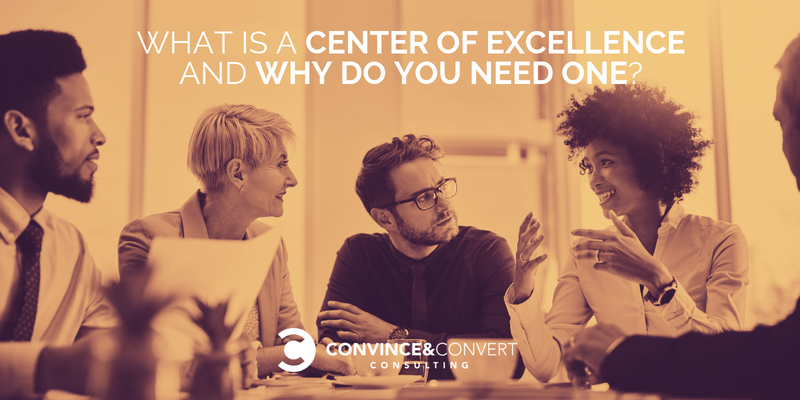 What Is a Center of Excellence and Why Do You Need One? As organizations scale, they often have marketing functions sitting in many different areas. Perhaps there are social media people who work both locally and in the corporate office, like some of our hospitality clients. Or perhaps there are many different teams which produce content that should be used across digital properties, like a client of ours which is a trade organization. In those situations, these organizations benefit from a structure that brings together various groups and sits outside of the regular reporting structure. We work with clients to create short-term task forces, but in addition to those bodies, we also work with clients on defining and implementing long-term centers of excellence. Sometimes called a “competency center” or “capability center” in academia, a center of excellence (COE) brings together people from different disciplines and provides shared facilities/resources. In business, and especially marketing, COEs should go further, in order to do what Gartner describes as, “concentrating existing expertise and resources in a discipline or capability to attain and sustain world-class performance and value.” These long-term groups combine learning and oversight around a specific area, driving the organization to shift across multiple disciplines together. For instance, you may have the heads of various marketing-related functions from across different product lines gather in a COE around implementing best-in-class social customer care for your customers, with shared customer history, multiple types of customized content, and more relevant content production. Therefore, the COE would focus on providing training, best practices, and resources for all of these different teams, while also gathering the data and learnings from all of the teams to create a positive feedback loop. Here are 4 best practices of effective COEs. Executive buy-in: To function well, COEs first need buy-in from the top to get them planned and implemented. Sometimes, this can be a challenge. As we’ve discovered as we’ve worked with various clients to implement these processes, sometimes it can take many conversations and hours to get buy-in from skeptical team leads who don’t want their independence encroached upon. However, if there is executive buy-in and clarity in terms of reporting functionality, it can be done smoothly. Cross-discipline team members: COEs also need to bring together people who are cross-discipline and whose experience touches the core area in multiple ways. For instance, a COE around content marketing might bring together a team that creates content for sales, a video content team, a customer service team, and a research team, all to create a more efficient and effective content marketing engine for your organization. Respecting and engaging the expertise of these different disciplines is key. Consistency and Governance: A consistency and governance plan are other key features of an effective COE. In working with our clients on implementing COEs, we often develop a cadence and structure for COE meetings and identify who in the group owns various responsibilities. For example, making sure that your COE has someone in charge of bringing in the analysis, and all team leads come prepped with an agenda may seem like a small thing, but it can make all the difference when your teams are extremely busy and time is a limited commodity. Shared resources: An important logistical consideration, COEs must have a system of shared resources. Templates, tools, calendars, and work standards must be accessible to everyone who is involved in the tasks at hand, and the organization must incentivize and monitor all participants’ adherence to these tools to ensure consistency. This process doesn’t work if only one or two people buy in. Everyone must use the system consistently. What is the benefit of a COE? As organizations get more complex, teams are often working in silos, not sharing their knowledge, despite the parallel evolution of various skills. COEs identify these areas and bring together internal resources so they can be shared among groups. This brings more organization efficiencies, but also creates more consistent customer experience across the organization, benefiting customers of both B2B and B2C companies. Because COEs are designed to drive innovation and improvement, they also create an organizational structure that encourages the different members to measure, experiment, and push each other forward. By promoting more transparency and more shared results, they can be a powerful way for the organization to align around business goals, rather than individual departmental metrics. How do you roll out a COE? As with all good things, COEs take patience to implement. Time and dedication are key to creating a successful structure. Identify the team members: Once you’ve defined the scope and nature of the COE, identify who should be a part of it, how often it will meet, and what information needs to be shared and agreed upon in each meeting. Regular meetings: Schedule regular meetings and make sure that the agenda is shared with the entire group prior to the meetings. Be sure that reporting and data, pertinent to the conversation, is distributed ahead of time. Set goals and timelines: Within the COE, develop specific goals metrics and timelines upon which the COE will measure and evaluate success, so that there is a consistent drive towards improvement. Create your resource hub: Establish a resource hub to share tools, templates, and updates on the COE’s activities — whether that’s a Slack channel or part of your project management tool. Remember: a COE should drive improvement and change within the organization. Don’t be afraid to challenge the group to get outside their comfort zone and be creative about solving problems together. Zontee Hou is a senior strategist at Convince & Convert, where she co-leads the strategy team and advises organizations ranging from Oracle Marketing Cloud to the International Monetary Fund. Her 10+ years in marketing has garnered industry recognition, including several PR News Platinum Awards and a Forrester Groundswell Award. She is the founder of New York-based agency Media Volery, a lecturer at both Columbia University and the City College of New York, and a speaker at events across the country.